We don’t get many kids seeking candy at our house. I’m not sure if there just aren’t many kids in the neighborhood, or if it’s our location (next to the pond, with a big gap before the next house). I decided to keep track. As usual, we bought a huge bag of candy, and we still had about half of it left to hand out tonight. But only 19 kids came. They arrived pretty regularly from 5:50 to 7:50. I comment on the figure’s style below. The white grid lines make it easy to see the details, and they still don’t get in the way of the plot. The use of color for the actual data makes them stand out better. Update: The code I used for the figure is here. It’s old-fashioned and inefficient, but it works. This entry was posted on 31 Oct 2011 at 10:02 pm and is filed under News, R, Statistics. You can follow any responses to this entry through the RSS 2.0 feed. Both comments and pings are currently closed. Good observation about the gray backgound. How to make the black border in ggplot2? I’ve added a link to my code. 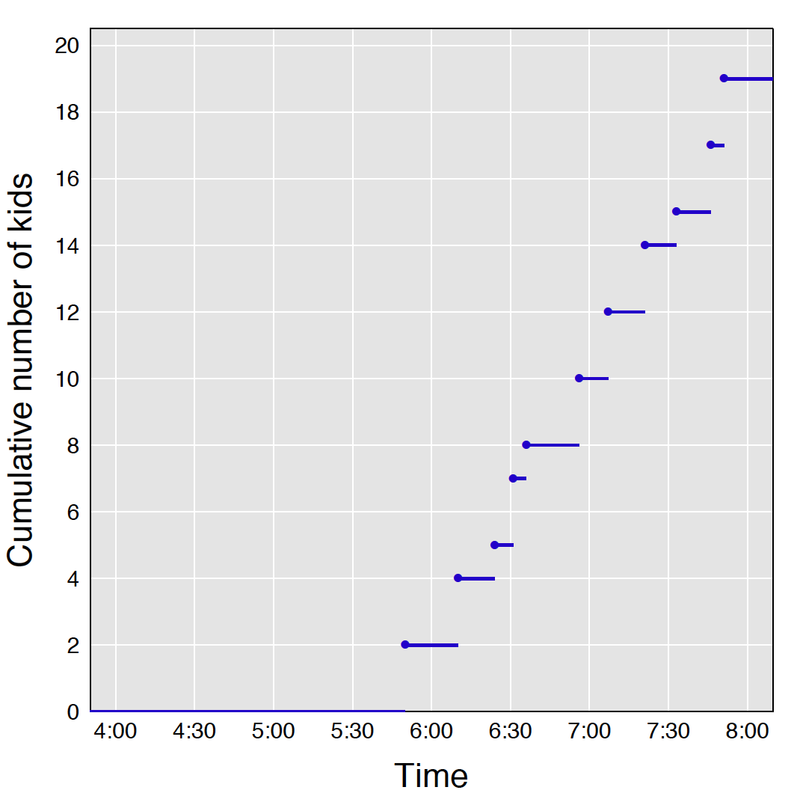 I didn’t use ggplot2 (still just intending to learn the system). So, it was my wrong consideration that grey background = ggplot2.